East L.A. math teacher Jaime Escalante (Edward James Olmos),who finds himself in a classroom of rebellious remedial-math students. He stuns fellow faculty members with his plans to teach AP Calculus,and even more when the mostly Hispanic teens (including Lou Diamond Phillips) overcome the odds and eventually go the distance. This is one of those sleeper hits about the charismatic teacher who takes a class of slackers and un-slacks them, and makes them actually have meaning in life. However this one seems to have a new fresh taste. 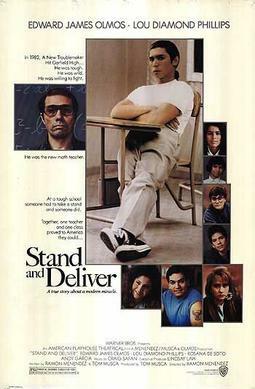 What really stands out in Stand And Deliver is that the movie revolves around the teaching of mathematics, instead of history or some vaguely designed social studies lesson plan. Thus, viewers inclined to cynicism are spared the cheap allegorical device of having the lesson plans parallel the main plot’s dramatic conflicts. The real good thing that is in this film is that both the teacher and the students are from the same ethnic group. It wasn’t one of those films where we had a white teacher trying to connect to a bunch of black students, instead they all understand each other and can avoid a lot of the racist colonial subtext. The film did have a couple of misfires that were very crucial. I didn’t like how by the end of the film it really did start to leave out details that would’ve meant something. By the end of the film when they are suspected of cheating cause they all got the same answers wrong, to go right to the argument about racism. We don’t really understand how and why they got all the same ones wrong and are left in a lonely place. Many details that were just little sub plots also come into place, just like the teacher having a heart attack and his family, were not very needed and seemed as unimportant. I really did like Edward James Olmos, as the teacher. He puts a new take on this story that we have all seen before and keeps us guessing of how we don’t even know how he will react. You can tell the anger lies within him and by the end of the film it comes out so perfectly. I also really did like Lou Diamond Phillips and thought he was very effective as the troubled but smart student, but I don’t think he was used very right. We never really got the sense of his anger that lied within him throughout the whole film. Instead we get him trying to really get these math problems done. If this film focused more on how he lived and reacted with the world I think this film would be way more compelling. Consensus: Though it is a story you have seen before, Edward James Olmos’ effective performance puts a twist on the film and makes it a more compelling but very effective teacher-student drama. Great perspective. I really enjoy this movie, and some of the things you mention about it are actually things which I agree would make the film better.